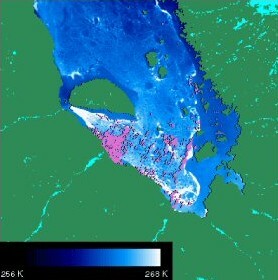 Ice surface temperature map of James Bay Canada, 24 February 2000. This infrared image was captured from the Moderate Resolution Imaging Spectroradiometer (MODIS) sensor on NASA's Terra satellite. —Image courtesy of Dorothy K. Hall, NASA/GSFC. 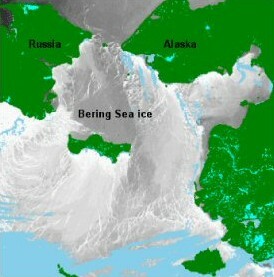 Ice surface temperature map of Bering Sea, 06 February 2004. Ice surface temperature is shown as white (highest temperatures) to dark grey (lowest temperatures). This infrared image was captured from the Moderate Resolution Imaging Spectroradiometer (MODIS) sensor on NASA's Aqua satellite. —Image courtesy of National Snow and Ice Data Center, University of Colorado, Boulder, CO.
Satellite sensors that measure infrared radiation infer the amount of heat emitted from an object at the earth's surface. Objects with an average earth temperature (roughly -50 to 50 degrees Celsius, or -58 to 122 degrees Fahrenheit) emit most of their energy in the infrared region. Because clouds also emit and reflect infrared radiation, clouds prevent satellites from detecting infrared radiation from sea ice. Sea ice melts during the summer, and the surface temperature increases to the freezing point. Melting sea ice is difficult to distinguish from surrounding ocean that is also near the freezing point. The following satellites and sensors observe infrared radiation.